Some Yummy Asian Recipes! – It Works For Bobbi! 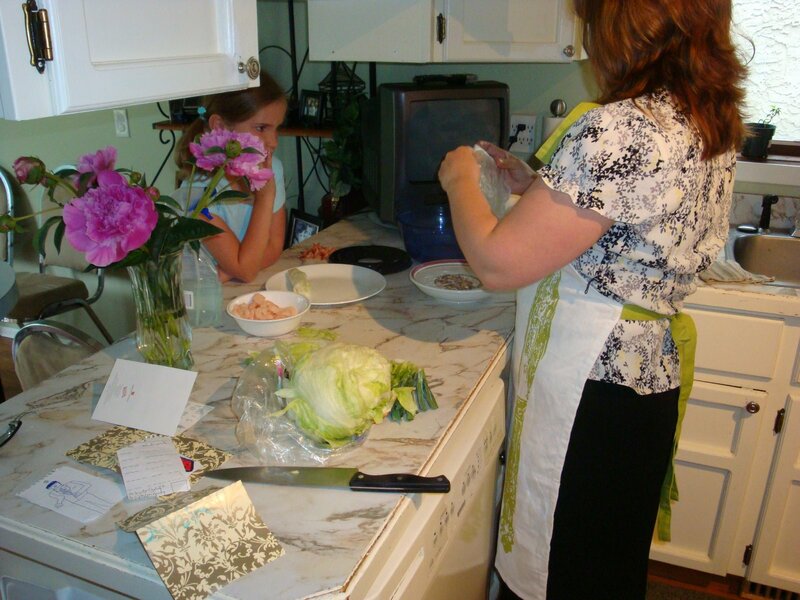 Published on June 25, 2009 August 9, 2016 by Bobbi-Jo G.
For Father’s Day, this year, I wanted to learn how to make some of my husband’s favorite Asian dishes. 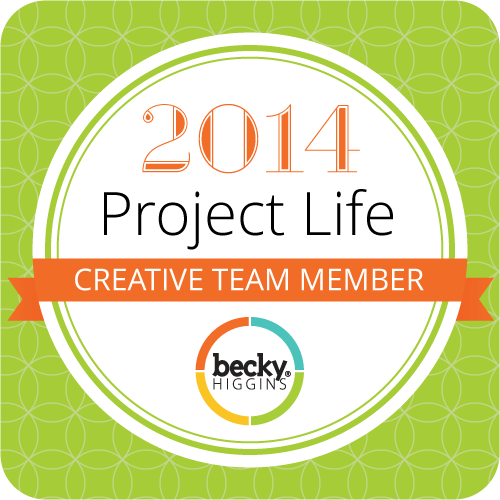 I was SUPER nervous about it – they seem like so much would be involved! BUT, I do consider myself brave in the kitchen, and lo and behold – they turned out delicious!! YUMMO! Because I’m such a sweet gal (hee hee) I just HAVE to share the recipes with YOU. 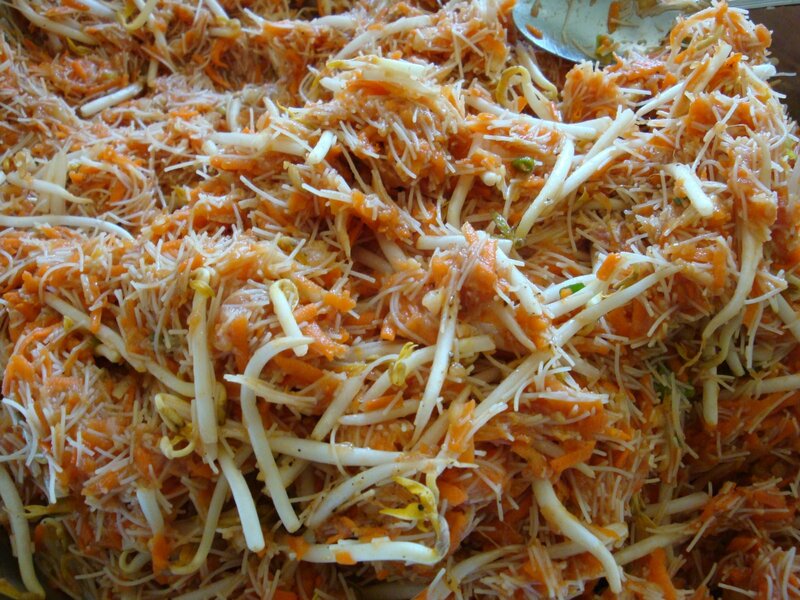 Soak the vermicelli noodles in a pot of hot water for about 10 minutes. Drain and leave overnight (just sitting in a bowl on the counter). You want the noodles to be fairly dry for this. 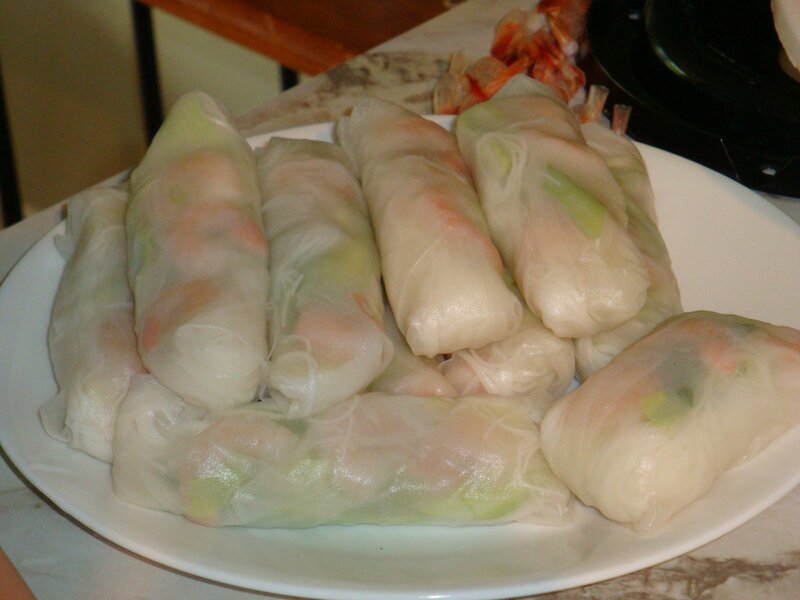 Take out the frozen spring roll wrappers and sit them on the counter to thaw while you make the filling. Grate the carrots, chop the onions, and green onions (I just used my food processor – worked great! AND fast!). Then you want to take handfuls of the carrots and squeeze out as much liquid as you can, then transfer to a very large bowl. Do the same with the onions. Put all of it into the large bowl. Beat 6 egg yolks together and place in a small bowl on the table (or counter) where you will be rolling them. (this is the brand of wrappers we bought). 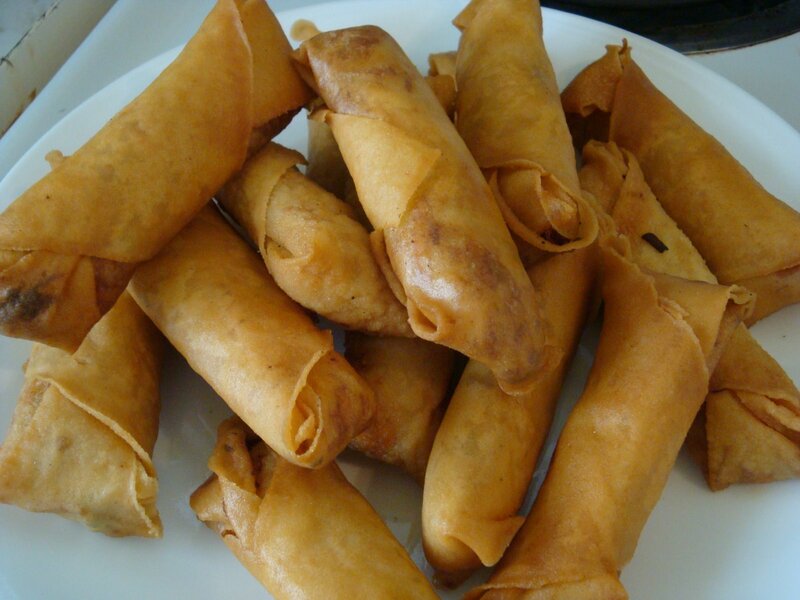 Now you take the spring roll wrappers, and separate them slowly (they could tear if you are too rough with them). Layer them one on top of the other, each wrapper at a different angle than the one before (this is hard to explain, but you can see in the picture below how I did it). You will want to keep a damp cloth nearby to cover them if there is a large space between rolling them. Heat oil in a deep fryer or a large pot on high. About 5 minutes before deep frying, turn down the heat to medium. 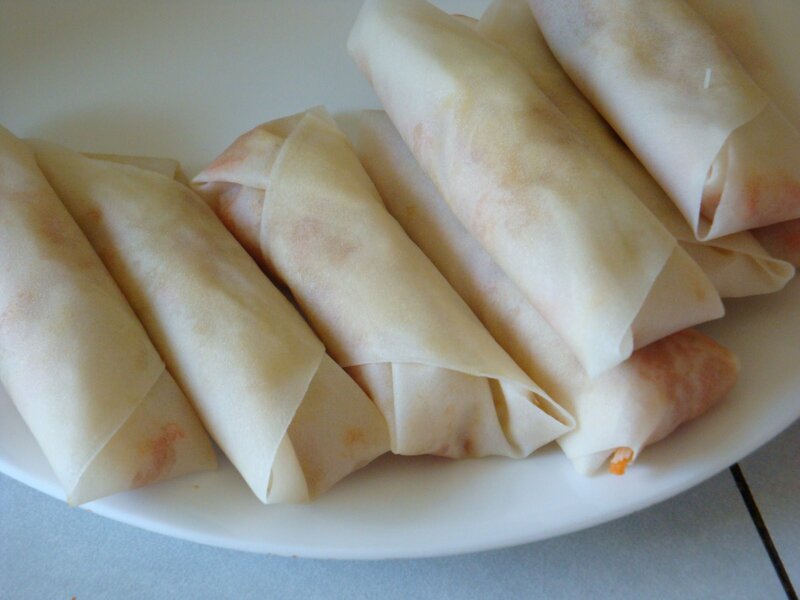 Add 4-5 spring rolls at a time and cook for about 10 minutes, or until the wrapper starts to brown and have a transparent appearance. Remove and drain on a paper towel. ENJOY! Oooh, these were my FAVORITE! SOOO good. We froze them after deep frying them and they reheat great. I also tried freezing some BEFORE deep frying, and I’m going to try baking them. We’ll see how that works out. This is super fun to do together with a friend. My friend, K (from the previous post) did these with me – in fact, she taught me how! What a great gal. We had great fun visiting while doing these. You can also quarter the recipe and only do 50 at a time, if you want to. For this recipe – I’m going to refer you to a how-to video that I used and it turned out PERFECT! 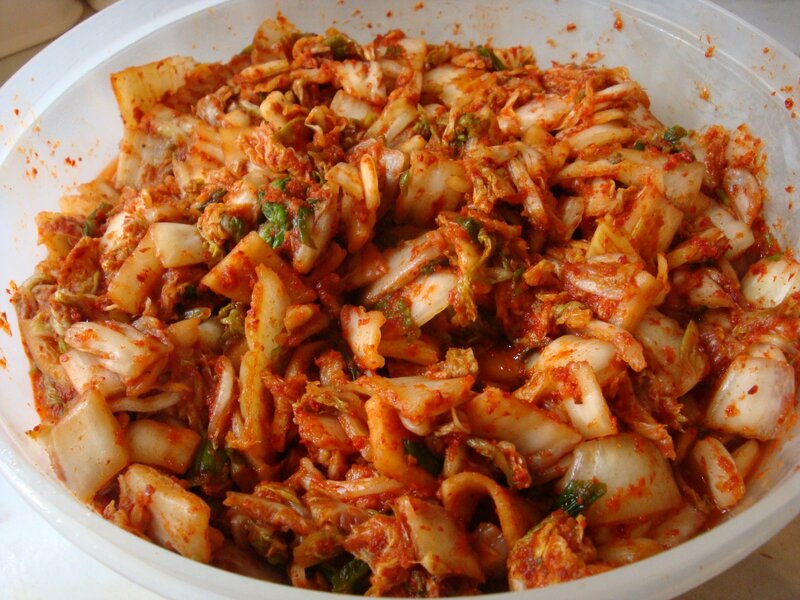 It’s a short and easy to follow video on how to make this spicy cabbage side dish. It’s one of hubby’s favorites and it’s difficult to find here. All the more reason to learn to make it! We loved it. We just used one whole apple instead of a half apple and a half apple-pear. It turned out great. Only took a couple of hours to make, and it was so easy. I’ll be making it again! These are super duper easy and we all love them! My daughter, TJ, helped to roll these and did a great job! Soften noodles in a bowl of hot water for 10 minutes, drain. Fill a large bowl with hot water. Dip one rice wrapper in the hot water for 1 second to soften. 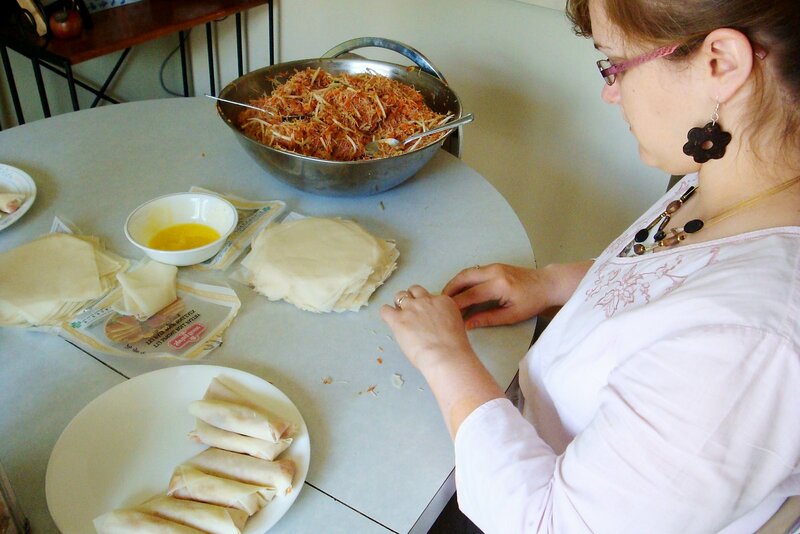 Lay wrapper flat, and place desired amounts of noodles, shrimp, pork, carrot, lettuce and cilantro in the center. Roll the edges of the wrapper slightly inward. Beginning at the bottom edge of wrapper, tightly wrap the ingredients. Repeat with remaining ingredients. Serve with Hoisin sauce or, better yet, peanut sauce! Oh my gosh!!! Thanks for the recipes and know how! YOU ROCK!!! oh my heavens you *almost* make it seem so easy that I could do that. maybe one day. I'll just come and share at your house??? I love making Asian foods. Sounds like you're and old pro at this now. My nephew served his mission up in Winnipeg and came home having learned all these asian recipes that are SO good! I really had to wonder if this was a canadian thing. LOL These look delicious! Can you say YUMM! with a double “m” exclamation point!!! How cute are you! I don't do nice meals like this these days— but I should give these a try. i should not have read this post at 10:50 pm. now i'm hungry, and all i have is a box of cheerios. 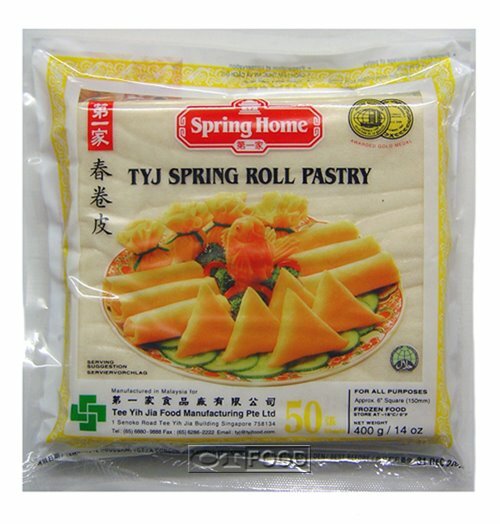 I'm really glad you posted the spring roll recipe! I forgot my copy at my mama's house!